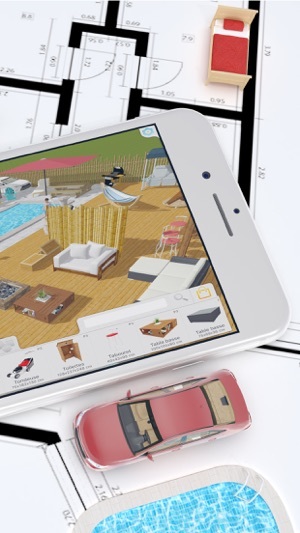 Keyplan 3D, our new home and interior designer is built on top of a unique technology unleashing features never seen before on the Appstore. It is a simple to use, useful and fun App to help you design, build, think and decorate your home or future home from the ground up. 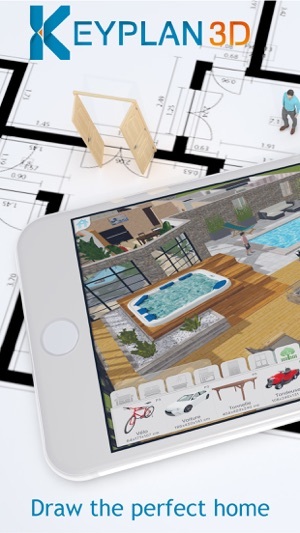 Whether you are looking to make alterations to your current home or plan on building your dream house, Keyplan 3D is there to turn this otherwise complicated process into child's play. Through our beautiful interface, designed with simplicity in mind, you can create amazing content without ever having to worry about complex menus and cryptic options. Create a wall or room by simply using our build button and our smart engine will take care of the rest. Forget about loading screens and unresponsive Apps : with Keyplan 3D you can visualise your project through our gorgeously rendered plans, which are both fully interactive and updated in real-time. Every aspect of Keyplan 3D has been designed to enable you to express your creativity like never before. 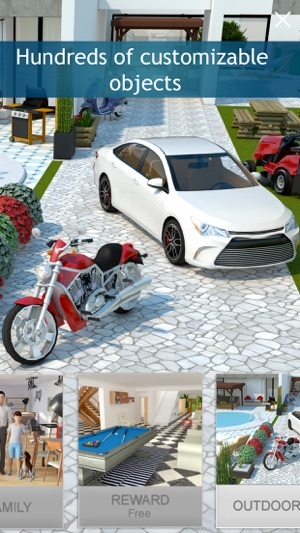 Behind Keyplan 3D there is a powerful technology, allowing you to build any shape imagineable, paint, decorate and place more than 350 free unique objects. Feeling proud of your creations? Go ahead and share them with your friends and family on your favourite social media platform. - House builder : creating walls is as easy as drawing a line with a pencil. Any shape is possible with our unique 2D/3D editing features. - Interior design : Place furniture, windows, doors - edit, change, remove, in either the 2D or 3D view. - Decoration : A large selection of paints, brick, wood, ceramic, textile to be used on any object or surface. Expect new free objects on a regular basis. - Many customisation options such as wall width and height settings, inch/meter conversion. - iCloud synchronisation to enjoy your project on all your devices, iPhone and iPad. 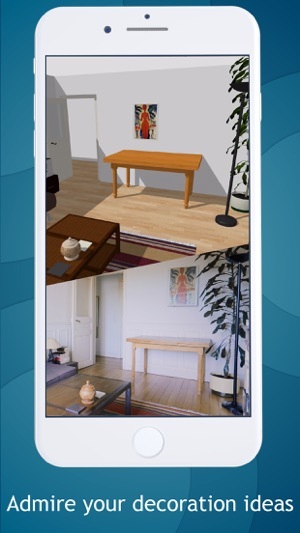 - Sharing : share 2D snapshots and 3D renders of your plan with your friends/family. Try it out and let us know what you think - we made Keyplan 3D for you and our only goal is to offer you the best experience out there. - Windows and doors are now realistically placed on the chosen side of the wall. - Measure in 3D can be seen through the building structure when selected to improve readability. - The furnishing dimensions are not correctly displayed in 3D. - Improved measures display. The measures will always be displayed the right side now. They could be upside down. - Improved readability in 2D to distinguish door and window. Door are now colored with the ground color. - Optimized windows and doors placement with better memory management and smooth movement. - Rectangular room will display width and depth under their name for better readability. - Removed redundant measures for more readability. - Fixed a bug when measures on each side of an opening could disappear. - Improved undo redo with keyboard input. Undo will return back to the first edition and not on each number typing. - Improve loading time of Keyplan and size of KPL files. - Fixed a bug, where some part of the wall could disappear in some rare circumstances. - Windows cotations are now displayed on both side of the wall. - Moving a window or a door close the wall border do not destroy the wall internal faces. - When a window is slightly larger than a wall, there will be an auto-resize to let the window be placed correctly. - Renaming a room is now done in a popup window to make this step easier. 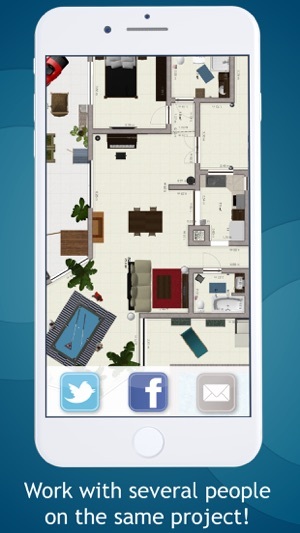 I got this app because I have always had an interest in architecture and interior design. I do enjoy this app (I got the full version, the lite was quite annoying), but it has a few areas that I would like to see improved. For one, I would like to have houses with multiple levels. Even if the floor are side by side, I would really like to have a “duplicate” feature so that I could copy the shape of the lower floor because it is quite difficult to recreate. I would also enjoy a feature that would allow me to add the wall dimensions manually rather than with the slider, because it takes a while to get the measurement I want. I do like the furniture, and the add-ons are lovely. Great choices for flooring and walls, and even the colors of the cabinets and window frames are customizable!! The lite version, however, was the world’s most irritating thing. You could only have one room, and there were many limitations. Had no problem upgrading and I’m glad I did. Potential but no one at home? This was exactly what I was looking for so tried the lite version and liked it very much. I tried to buy the full version through an in-app purchase and thought it had gone through but my icon and apple store still say I still have the lite version. So far, so good. Two days later the app now crashes every time I add a window or door to a wall. The program sends an email to the developers when it crashes BUT the address does not exist and so it is returned undelivered. Where did the developers go? There doesn’t appear to be any support for the app. I am left wondering whether I should buy it again and start over but fear I will just loose another $6 plus all the floor plans I already have created. Writing a review appears to be the only way to contact the developers. I hope they will fix this bug (it had worked fine until today) and will make certain I have the full version. I really like the app when it is working! For once an app with no glitches when I do stuff! Also there are no coins, like you have to pay $100 to get a Couch. Every ting is free! Even though you can only design one room in the lite version it is worth it. Just make a big room with different sections. I am very pleased. I got the game on a Wednesday and by Friday I completed my dream home.😍 truly I get why you have to make a lite version and I don’t blame the designers for making a one room restriction on the lite version. Does it bother me? Yes. Do I like it? No. But do I get why they have to make it so? Yes. People have to make money. You need to have money to live. I highly suggest this game and I thank the designers for making such a good game where you can design simply and quickly. I hope after reading this you will get this app. It is TOTALLY worth it!